Montefiore’s eighth novel (The Woman From Paris, 2013, etc.) is a love story with so many layers that perhaps it’s best to call it a story about love. Toss in broken family ties, a tragic death and a ghost who must also learn to love, and the secrets gradually unfold. When 33-year-old Ellen Trawton can no longer bear her aristocratic mother’s pressure to marry for all the wrong reasons, she secretly flees England to seek her Irish aunt, whose existence she knows of only from letters she’s found. Aunt Peg welcomes her with open arms, as do her (surprise!) four uncles. Ellen is immediately drawn to beautiful Connemara and her newfound family, and she is so unable to deal with pressure from home that she impulsively flings her iPhone into the ocean, severing communication with those she left behind. Drawn to the ruins of a local lighthouse with a disastrous history, she begins exploring the area and slowly unravels her mother's connection to Ireland and the true story of her own roots, and she finds love…if only the ghost will allow it. 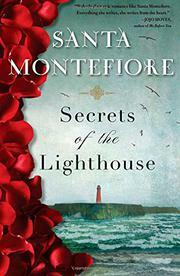 Chapters written from the ghost’s point of view reveal Montefiore’s leanings: There are spiritual vibrations, channeling, life after death in different forms. Readers will suspect the truth long before the characters do (Ellen seems too naïve for 33), but the ghost brings an interesting perspective. Montefiore intertwines lush description of Connemara with her character-driven plot, and all ends well on Earth and beyond.